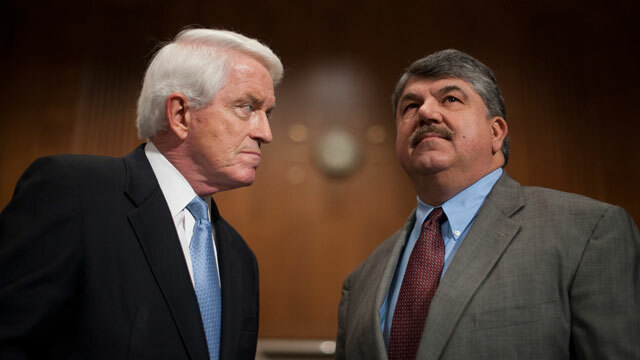 U.S. Chamber of Commerce President and CEO Thomas Donohue and AFL-CIO President Richard Trumka talk before the start of the full committee hearing on 'National Leaders' Call to Action on Transportation', in the Dirksen Senate Office Building. Business and labor leaders have come to an agreement in principle about one of the thorniest parts of immigration reform -- what to do with future flows of immigrant workers. A group of Democratic and Republican senators working on an immigration reform bill tapped the U.S. Chamber of Commerce and the AFL-CIO to develop common principles that could help anchor this aspect of reform legislation. Now, after months of negotiations, the two parties have agreed on several core principles that they've issued in a joint release. 1. That American workers are offered jobs before they go to new immigrants. Business and labor want to add a system to better disseminate information about jobs in lesser-skilled occupations, with particular outreach to those in disadvantaged communities. 2. The creation of a new worker visa. The visa would be designed to better respond to the needs of the marketplace, while still protecting worker rights, according to the release. The new visa would allow workers to move beyond a temporary immigration status and give workers the ability to switch jobs, but "in a way that still gives American workers a first shot at available jobs." The number of available visas would also expand and contract along with the economy. 3. The creation of a new federal bureau that would make determinations about the labor needs in the U.S. The bureau would use labor market data to inform the public and Congress about the country's workforce needs, which would be used to help determine future immigration flows. The body would be politically independent, in the manner of the Bureau of Labor Statistics, the release said. Sen. Charles Schumer, the informal head of the Senate "gang of eight" working on immigration reform, has encouraged the talks between labor and business, and a legislative aide involved with drafting the Senate bill told ABC/Univision last month that legislators were waiting for a compromise between the two parties. A guest worker program isn't specifically mentioned in the release, but a new worker visa could potentially function in the same manner. The proposed visa would bring in workers in a more streamlined, easier process than is currently available, and would have the potential for those workers to move to a permanent immigration status. We've gotten further clarification about the new visa that business and union leaders are proposing. The visa would have an option for eventual permanent residency and will be different from existing temporary-work programs, according to Ana Avendaño, a top immigration policy aide at AFL-CIO. "We're not creating a guest worker program," Avendaño said. "Guest worker programs keep workers in permanent temporary status." Avendaño described the new visa program as something "that respects workers' rights and meets the needs of business," calling the compromise "a really important moment." Avendaño said that the AFL-CIO and the U.S. Chamber of Commerce haven't come to an agreement on how long a worker using this new visa would need to wait until she or he could apply for permanent residency. The joint proposal would also create a federal bureau to crunch labor numbers and determine needs in the U.S. workforce. That data would then be presented to Congress, which it could use when considering immigration flows. Avendaño said that the two sides have not hashed out exactly what role the bureau would play in determining future immigration flows. Of course, all of this needs the approval of Congress. But Avendaño was hopeful that a bipartisan group working on reform in the Senate -- dubbed the "gang of eight" -- would adopt the principles released on Thursday. "If business and labor have agreed to an approach," she said, "it really wouldn't make sense for the gang of eight to then go in a completely different direction." The agreement between business and union interests is important because it could play a major role in preventing illegal immigration in the future by providing legal pathways for immigrant workers to come to the U.S. Regulating the flow of immigrant workers going forward is one of the biggest questions left unresolved from the Senate immigration reform blueprint, and a White House reform plan leaked over the weekend didn't get into those details, either. While this agreement doesn't resolve those issues, it presents a basic framework for Congress to get started.